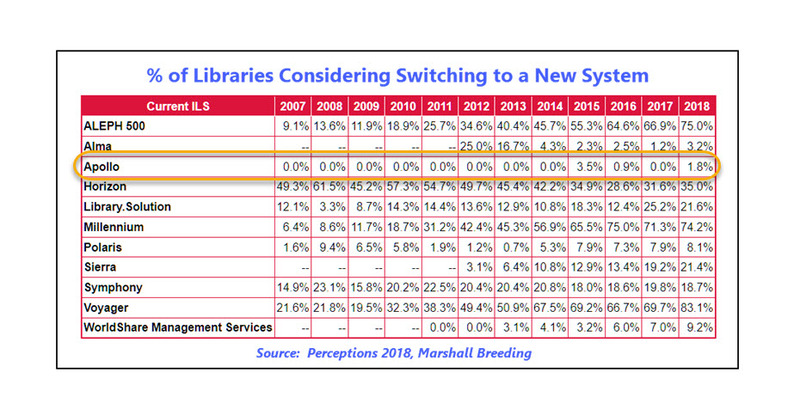 Marshall Breeding’s annual “Perceptions” survey is an international survey of library automation customers. For the TENTH straight year, the Apollo™ ILS received top rankings. The report was released on February 10, 2019. Mr. Breeding’s summary is “…Apollo has exceptionally happy customers.” And here are some customer quotes submitted as part of the survey. Apollo from Biblionix is out of this world fantastic! In my 30+ years as a public library director I have never worked with any company that puts their customers first the way Biblionix does. Apollo is still – hands downs – the best ILS product we’ve worked with. Worth every penny we’ve spent on it. Biblionix continues to provide exceptional service and genuinely-useful product development that responds to real customer needs. In particular, we appreciate Apollo’s seamless integration with our eBook platform – no other vendor has been able to offer this. For more details, see the “Perceptions 2018: An International Survey of Library Automation” survey. Please note that libraries with up to 100,000 holdings are considered “small”/”very small” in this survey.